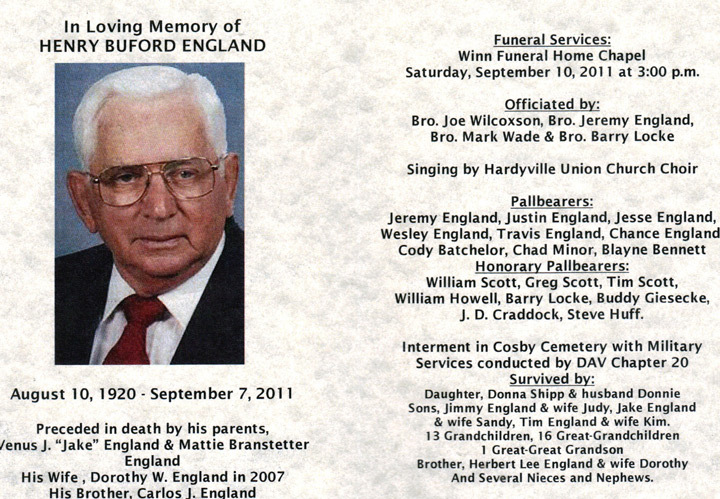 Henry Buford England age 91 of Hardyville passed away after a short stay at Caverna Memorial Hospital at 2:30 p.m. Wednesday September 7, 2011. He was a Hart County native, a Methodist at the Hardyville Union Church where he served as an Elder and Caretaker. He was a veteran of the U.S. Navy in World War II and a retired member of the Hardyville Vol. Fire Department.He was Community Service Minded and had received numerous awards. One Daughter, Donna Shipp & her husband Donnie of Monticello, Georgia. Three Sons, Jimmy England & his wife Judy of Hardyville, Jake England & his wife Sandy of Tompkinsville, and Tim England & his wife Kim of Hardyville. 13 Grandchildren, 16 Great-Grandchildren,and One Great-Great Grandson. One Brother, Herbert Lee England & his wife Dorothy of Hardyville. And Several Nieces and Nephews. Expressions of Sympathy may be made in the form of Contributions to the Cosby Cemetery.